The attitude shown by parents and spectators at games toward their own child, the opposing team, the officials, and coaches go a long way towards influencing the child's values and behavior in the game. Disrespect and criticism of officials and opponents undermine the purpose of sport and brings into the game stresses beyond those of competition. Such stresses have no place in a Youth League Baseball or Softball program. Make baseball participation for your child and others a positive experience. Attempt to relieve the pressure of competition, not increase it. A child is easily affected by outside influences. Respect your child's coach and league officials. These individuals are volunteers giving of personal time and often money to provide a recreational activity for your child. They provide a valuable community service, often without reward other than the personal satisfaction of having served the community. The opposition are friends, not enemies. Without them your child could not participate. Applaud good play by your team and by the opposing team; never ridicule or criticize the play of any player on the field. Between the exuberance and joy of the winner and the tears and disappointment of the loser we find a person called an umpire. Understand that the umpire's function is to help assure a fair and safe game. They are trained and tested and call the game to the best of their ability. Do not openly question their judgment and never question their honesty. The umpire is the game's symbol of fair play, integrity and sportsmanship. Parents and spectators should encourage the child to accept the results of each game and to be gracious and humble in victory, and proud in defeat, working towards further personal improvement to experience the fun and satisfaction in developing personal skill and ability. Remember: Youth baseball is a learning experience which goes beyond your child acquiring playing skills. Your own attitude and conduct will greatly influence the quality of that experience. 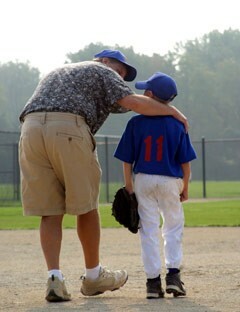 The league requires that a child's parent or guardian be present at all practices and games of leagues T-Ball through Pony (Junior in Softball) or, in their absence, to have made proper arrangements with another parent or guardian to be present and responsible for the child in the event of bad weather or injury. Repeated violations of this league rule could result in removal of the player from the team. There will be a $10 administrative fee for refunds requested before a league draft. NO refunds will allowed once a player has been drafted. Each parent agrees that their child will play on the team to which he/she has been drafted or is assigned. BAAB is under no obligation to accommodate special requests for teammates or coaches either before or after the team draft. No refunds will allowed once a player has been drafted.